Everyone knows that photography is about being in the right place at the right time, but if you leave that to chance there’s a high possibility you’ll miss some of nature’s greatest events. Some of the spectacles we’ve chosen here are about light, while others concern weather, geology and even biology. Photographically speaking, they’re all very different subjects, but what they all have in common is their deep connection to our planet and its mostly seasonal changes. So get your diary out and get ready to plan a very precisely timed adventure or two. 'Tornado Alley' winds through Texas, Oklahoma, Kansas and Nebraska, and it's typically active between March and late May, when it brings rapidly rotating columns of air that can wreak havoc. Naturally, tornado tourism is not for everyone. The sense of danger when chasing a super-cell can be extreme, but there are just as many days when tornadoes are predicted and nothing happens. Tornadoes are caused by the updrafts and downdrafts of unstable air during a thunderstorm, when a wind shear tilts to form an upright vortex. Since the Midwest is sandwiched between the Rockies and the Gulf of Mexico, the conditions are perfect here. Storm Tours and Extreme Tornado Tours are good ways of getting your eye in. Read more: What's the difference between weatherproof and waterproof cameras? Cloud spotter? Although they're called clouds, noctilucent or 'night shining' clouds are no regular weather phenomenon. Occurring about 80km up in the high atmosphere, far above where regular clouds form, noctilucent clouds appear as thin streaks just after sunset. Incredibly faint, it's only the sunlight from below the horizon that's able to catch them, causing an eerie glow. They're impossible to predict, though they only occur in mid-latitudes – between 50° and 70° north and south of the Equator (the U.K. is at 50°-56°) – during the so-called blue hour when the sun is around 6 to 16° below the horizon. Although there is little point in going outside specifically to see noctilucent clouds, if you are out and about taking landscape photos around this time, have a look at the northern sky and see if you can spot them; one day you’ll get lucky. For a few precious minutes every 18 months or so, the moon gets precisely between the sun and the Earth, throwing a 60-miles-wide moon shadow across one lucky country or two. It’s called totality, and it only lasts for two minutes during the next eclipses in 2019 and 2020, but during that short time it’s possible to see the sun’s corona amid darkness in the day. It’s a magical sight, and not all that difficult to capture on camera if you know what you’re doing. The results can be astounding, as this skillfully processed photograph by HDR astrophotographer Nicolas Lefaudeuxshows. The next two total solar eclipses both cross South America; in 2019 it’s northern Chile and Argentina, and in 2020 it’s across the south of both countries. The next total solar eclipse in the UK isn’t until 2090, but the US gets another turn in 2024. There are few more delicate and fleeting environments than naturally formed ice caves and ice tunnels, but to get photographs of the mesmerising blue ice requires both good timing and good luck. Europe’s largest glacier, Iceland's Vatnajokull, contains easily accessible ice caves, though organised trips can often be cancelled at short notice due to flooding. At Langjokull, it’s all a bit more reliable since an intrepid team has carved out a giant ice cave by digging into the glacier itself from above. Into The Glacier runs tours, and though it’s less dramatic than the natural ice caves, this man-made miracle – complete with LED lights installed in the ice itself – still makes for a dramatic shot. It’s also safe to visit all year round. Always take a tripod and as wide a lens as possible (or even a fisheye) to any kind of ice cave. When it was designed in the 1800s, Manhattan’s iconic grid plan, which places streets horizontally and vertically, was a game-changer for city planning worldwide. However, its designers can't have known that their decision to also align their city's layout to the cardinal points would produce an accidental photographic phenomenon. For every May and July, a sunset occurs precisely at the horizon of east-west streets, creating a perfectly composed photo opportunity of a sunset between skyscrapers. Called Manhattanhenge or the Manhattan Solstice, the days when the sun's setting points align with the city's grid have become Instagram favourites. The next one will be visible as a full sunset on 12 July at 8.20pm EDT, with a half-sunset view the following day. Volcanic eruptions may be impossible to predict, but that's not the case with geysers. A vent that periodically ejects gallons of hot water and steam, they're dramatic and photogenic, but also come with a degree of predictability. 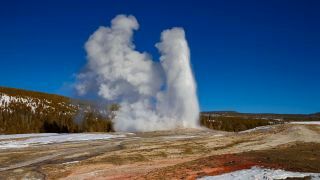 The biggest regular geyser is Old Faithful in Wyoming's Yellowstone National Park, which spurts water 32-56m into the air every few hours (daily predictions are here). Another predictable geyser is the 30m high Strokkur in Iceland's Haukadalur geothermal field, which blows every five minutes. However, both have other geysers nearby that are almost as impressive, though not as frequent or as predictable. There are various ways of photographing geysers, from trying to image the entire spout, to zooming in to capture 'the bubble' that builds up just prior to the geyser blowing. Since both sites have many – many – tourists in summer, the best advice is to go off season, get lodgings nearby and aim for something unusual, like a post-sunrise shot or, in the case of Iceland, with a backdrop of the northern lights. Also known as the aurora borealis, this phenomenon is surely on every photographer’s bucket list already – but it’s actually best not to go looking for them. The result of energised particles from the sun smashing into Earth’s magnetic field, the green (and sometimes red) lights regularly shimmer, twist and pulse in the skies above the Arctic Circle every evening all winter. However, clear skies are essential and winter is a famously cloudy time of year up there, so even week-long trips can often end in disappointment. So, go spend some time in Alaska, Iceland or Lapland (Norwegian, Swedish or Finnish) for another reason – most likely out-of-this-world landscape photography opportunities – and when the clouds part to reveal the ‘green lady’, get your camera out and count yourself lucky. In Japan they go crazy for cherry blossom, with family, co-workers, and couples all organising 'hanami' (cherry blossom viewing) sessions, a centuries-old Japanese tradition. Called sakura in Japan, there are cherry blossom trees in every public place that come to life for a short period in spring when their flowers bloom. Supposed to represent the fleeting nature of life itself, iconic places to photograph during this week-long phenomenon include Shinjuku Gyoen or Ueno Park in Tokyo, or along the Philosopher's Walk in Kyoto, or its many temples. However, the event begins in Okinawa in January, reaches Kyoto and Tokyo at the end of March or the beginning of April, and hits Hokkaido in the north in mid-April. The sakura zensen – the cherry blossom front – is carefully predicted and tracked by the Japanese Meteorological Agency. Book your hotel as far ahead as you can. When an eclipse can be seen by the US, the world gets to hear about it. That was the case last January, when a so-called 'super blue blood Moon' was viewable from most of North America. Despite the hyperbole, the event was nothing more than a rather common total lunar eclipse. Common they may be, but when the moon enters the Earth's shadow during its full-moon phase, the result is brilliantly photogenic. This July it's the turn of the rest of the world to watch the lunar surface tone for a bright white to a red, rusty, brown or orange colour. Since the Moon will already be in the shadow as it rises on 27 July as seen from the UK, have your camera ready for that moment – just before 21:00. The moon will reach maximum eclipse at 21:21, when it will be completely reddish. The next one is on 21 January 2019. Get your timing right and shooting stars are not all that difficult to photograph. With clear skies above, take a series of 30-second exposures of the night sky and, with a bit of luck, your camera will capture a shooting star in a frame or two. The best time to try that is just after midnight until dawn on 13 August 2018, the peak of the year's best meteor shower, the Perseids. As many as 100 shooting stars per hour – including some super-bright fireballs that leave a streak behind them – could fall from the sky. It's one of nature’s most remarkable shows, which happens every year as Earth's orbit takes it through the same pile of dust and dirt left over by a comet. Since it's also New Moon, 2018 represents the best opportunity possible for a dark sky and bright shooting stars. The best advice? Go camping, put your camera on auto, and lay back and watch.